Tall, dark, and mysterious—Ryder Black is everything a girl wants. The catch? He’s trouble. Naturally, he’s irresistibly charming. Surprisingly, he’s impressively academic, too. But it’s his knack for getting into fights that makes him notorious. Hell-bent on making contact, Ryder gets a sneak peek into the quirky world of April when she stuffs all of her fingers in her mouth and faints the first time he talks to her. She’s unusual. He’s captivated. 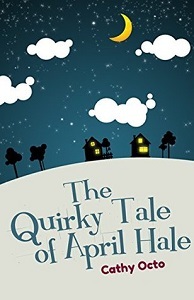 ‘The Quirky Tale of April Hale’ is a story about a girl, April Hale, who’s a little different from the rest of us. Ok, a lot different from the rest of us. And while I enjoyed the writing style of the author, the characters were not as enjoyable. Let me start with the good. The author, Cathy Octo, seems to have a light writing style which will please a younger audience. I’m not sure if the Yoda speaking will appeal to them but I imagine it appeals to the science fiction fans so that’s a plus there. And the cover is brilliant. So quirky and cute that I went for this book immediately. I see the writer, with some more character development, writing a lot more books and perhaps becoming good at what she does. Unfortunately, for me, the bad outweighed the good even though I rated it three stars. April Hale, aspie, geek and neighbour to bad boy Ryder was made necessarily dislikeable by the author by simply withholding information. And even now, after knowing her condition, I don’t really buy that she is as slow or awkward as she is portrayed. It is only at the 50% mark that you are told that April is an aspie, (That she has Asperger’s Syndrome). Till then you think that finally, an author has taken socially awkward to the next level and made the character actually slow. Which makes no sense because she is supposed to be smart. And you would think that her neighbour would know because the school SHOULD have been informed about her condition. But he doesn’t either. Now I’m not going to pretend to be an Aspie expert, in fact till this book I thought it was another word for autism, but the point is, even after doing my research and watching a lot of videos about it, I don’t buy the character. And if I hadn’t accepted the book for review I would have dropped it a couple of pages in. The problem is that while she has a lot of potential as a character, she is shown to be nothing more than her love for movies and her syndrome. She has nothing else to her. Absolutely nothing. And Ryder? Well he feels like quite the cliché. Good girl meets bad boy taken to the extreme. Good girl with a mental disorder meets bad boy who deals drugs and fights in street fights for money. Of course he isn’t bad because he is bad, he is bad because there are problems in his family and he doesn’t have any choice but to be bad. I understand what the author was trying to do with this book. She is writing something different and trying to add more diversity to characters in YA books. Unfortunately this was a failed attempt for me. I understand that this is for teenagers, but I do wish that the teenage aspie representative here was shown to be more than just Yoda style speech, shivering and her typical teenage love for a bad boy. Pick this up if you are younger and want to check out something that is different. Skip this if you are used to reading more mature books and characters. Hi! I’m Cat, I’m older than you might think I am, an artist, a designer, and I happen to love to write. In real life, I love fashion and hanging out with friends and I’m generally very bubbly and happy.